On March 8, 1827, Vachel Kirk and Jane Delzell married in Licking County, Ohio. The young couple - my fourth great-grandparents - started their lives together on the rugged Ohio frontier. Soon, the family began to grow. On February 22, 1828, Jane gave birth to a daughter named Sarah. 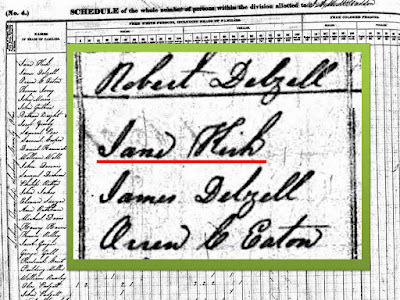 Two years later, on January 2, 1830, the family welcomed the birth of a boy named James, my third great-grandfather. 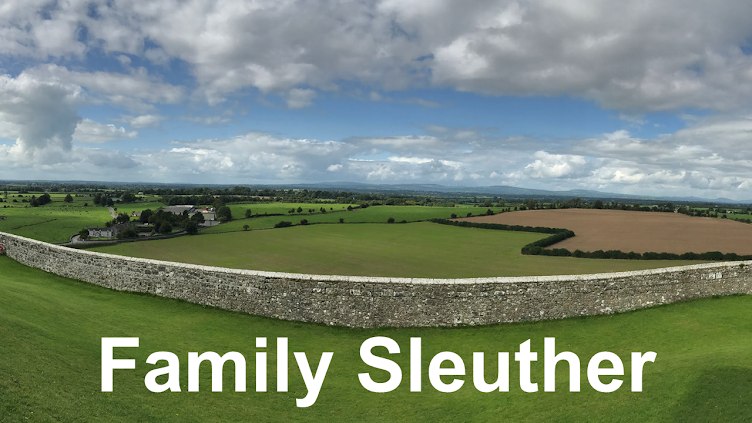 In March 1832, tragedy struck the growing Kirk family. Vachel died when he was just 26 years old, leaving his young widow - who was four months pregnant - alone to raise their family. Less than four months later, on August 16, 1832, Jane - now a single mother - gave birth to a son named Vachel Jr. in honor of the family's recently departed patriarch. The settlement of Vachel's estate dragged on for several years. Finally, on April 11, 1835, the proceedings of the Licking County Court of Common Pleas awarded legal guardianship of the three Kirk children to their mother Jane. 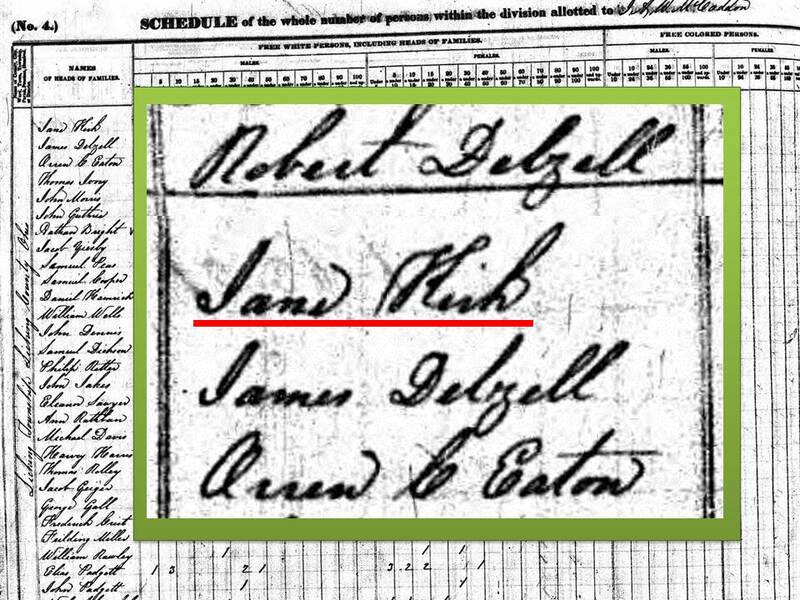 During her widowhood, Jane (Delzell) Kirk was one of those rare examples of a woman appearing on a pre-1850 census by name because she was now the de facto head of household. The 1840 US Federal Census gives a sense that, although she was a single mother, she had the support of her family. Jane and her three children were enumerated living between her brothers Robert and James Delzell. In the ensuing decades, the Kirk children would grow, marry, and begin families of their own in Ohio. 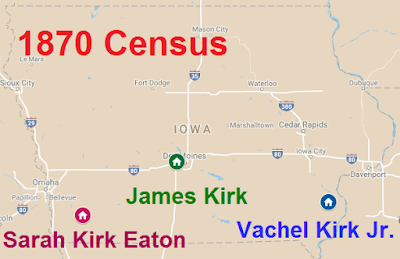 On March 3, 1847, Sarah Kirk married Francis Eaton, son of Oren Eaton who was enumerated in the 1840 census just two doors down from Jane Kirk. On September 22, 1851, James Kirk married Hester Griffith. On March 20, 1858, Vachel Kirk Jr. married Mahala Lawrence. Eventually, the allure of westward expansion piqued their curiosity. That comes as no great surprise since many of Jane's late husband's siblings had already moved to Crawford County, Illinois. Her children, though, opted to move further west from Ohio to the farmlands of Iowa. James was the first to move. An 1880-published history of Polk County, Iowa, featured a biographical sketch of his life. While in Ohio, "he learned the cooper's trade, and followed it until the spring of 1858, when he came to this county [Polk County, Iowa]." Next up was Sarah (Kirk) Eaton's family. Years later, her obituary would recall that, "In 1865 they removed to Iowa, and in 1870 came to Leon..." Her family was enumerated in West, Montgomery County, Iowa in the 1870 US Federal Census enumeration. In 1866, Vachel Jr's wife, Mahala, passed away in Ohio when she was about 30 years old. His obituary noted that, "Mr. Kirk then came west with his two little children, bringing his mother [Jane Delzell Kirk] with him to care for them." By 1870, he was settled in Morning Sun, Louisa County, Iowa. With Vachel Jr.'s move, the widow Jane and her three children and their families were now all settled in Iowa. Sarah (Kirk) Eaton passed away on November 23, 1912 at the age of 84. She was survived by four daughters: Mrs. Emma Harvey, Mrs. Len Hamilton, Mrs. W.A. Hunt, and Mrs. Sam Rush. Vachel Kirk Jr. passed away on October 13, 1916 at the age of 84. He was survived by two children: Mr. Frank Kirk and Mrs. Flora Jarvis. James Kirk passed away on August 29, 1917 at the age of 87. He was survived by four sons: William, Henry, James, and Charles Kirk; and three daughters: Mary Scovel, Jennette "Nettie" Seibert, and Bessie Clarke. Despite living during the first part of the 20th century, I've never seen a photo of any of them. Is there a photograph of James Kirk, my third great-grandfather, tucked away in a dusty Iowa attic? Or maybe a picture survives of one of his siblings or even their mother Jane, who passed away in 1886? I'm putting it out into the universe and we'll see what the internet turns up. The search is on for descendants with more of the Iowa Kirk story. Stay tuned! Any idea about the cause of Vachel Sr's death at such a young age? Or that of his daughter in law at 30? So sad. Unfortunately, I don't know what caused either of them to pass away at such untimely ages. Perhaps disease or a farming accident for Vachel, but just speculation. I always find it so sad when someone that young dies---and very frustrating when I can't find out why or how. Oh, that's sad! This is only the second time I've ever heard of the name Vachel. The first is the American poet Vachel Lindsay. I was previously unfamiliar with the name. It proved helpful, though, because it was so unusual it was easier to find and confirm my ancestor in the records.